Camping is a fun and challenging activity. Taking your kids camping is not just an adventure; it's also a chance to bond as a family and teach important lessons in an outdoor setting. Unlike a traditional classroom, however, the outdoor environment requires special safety considerations for kids. 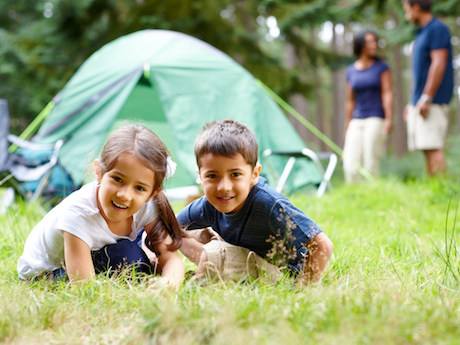 To keep everyone safe on your next family camping trip, it's important to follow these camping safety rules for kids. For more information, tips and recipes, too, check out our Beginner's Guide to Family Camping. Outside the immediate boundaries of the camp, children should follow the rule of twos. This includes going to the restrooms, showers and anywhere else in pairs. Remind young children of this rule and reinforce that if one of them gets hurt or if they find themselves in trouble, one buddy will always be able to go for help. Whether you create your campsite footprint with markers like "the big tree" or "past the picnic tables," or make a fence by attaching string to posts and trees, it's important that kids know to stay within the boundaries of the campsite. As fun as it may seem to play in a stream or lake, children need to understand that an adult must always be present when they're near the water. Make sure to include plenty of water play time in the family schedule, so kids are less tempted to go it alone when no one's looking. Parents and kids should learn to identify poison ivy, poison oak and poison sumac. Avoid them while exploring the outdoors, and wear long pants, socks and enclosed shoes in wooded areas. As an added precaution, remind kids to wash their hands frequently to avoid spreading the rash if they have accidentally come in contact with these irritating weeds.